If you are looking for an authentic place to stay in Marrakech a Riad is a must. 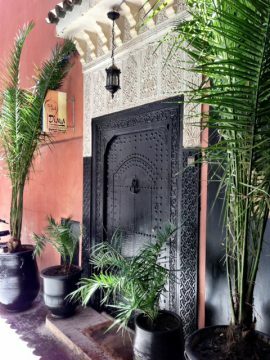 Riad Diana is located only a short walk from Jemaa el Fna square, the hart of the Marrakech Medina. I recommend booking a private taxi from the airport because you will definitely get lost if you try to find this place on your own. It’s easy to book through the Riad. Breakfast, with sweet fresh orange juice, is served on request at the patio or on the terrace.